On Sunday, I stood once more at the starting line of the Credit Union Cherry Blossom Ten Mile Run. This race has become a staple of my race calendar and in years past, I've been grateful just to be on the starting line. It symbolizes a return to running for me. This year, while I wish I had gone about two minutes faster, I'm trying to remember to feel gratitude for the day no matter what. I had really hoped to go under 90 minutes but many people suggested I revise that goal because of the wind. I think the wind did make it harder to finish those last two miles, but I also wonder if I have only myself to blame. Probably both right? 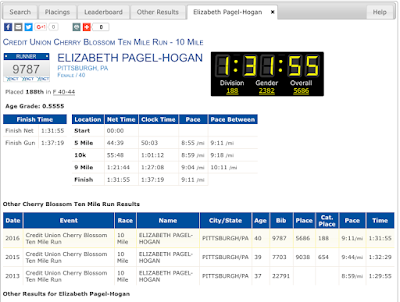 I should be happy I ran faster than last year, which was a shorter distance by quite a lot. But I did want that 1:29:59 or faster time. 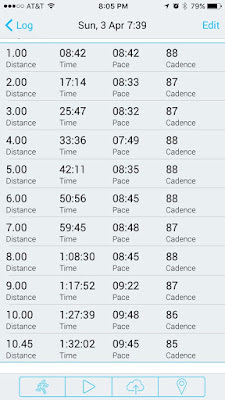 If you take a look at the splits from my app, I did run 10 miles under 90 minutes. 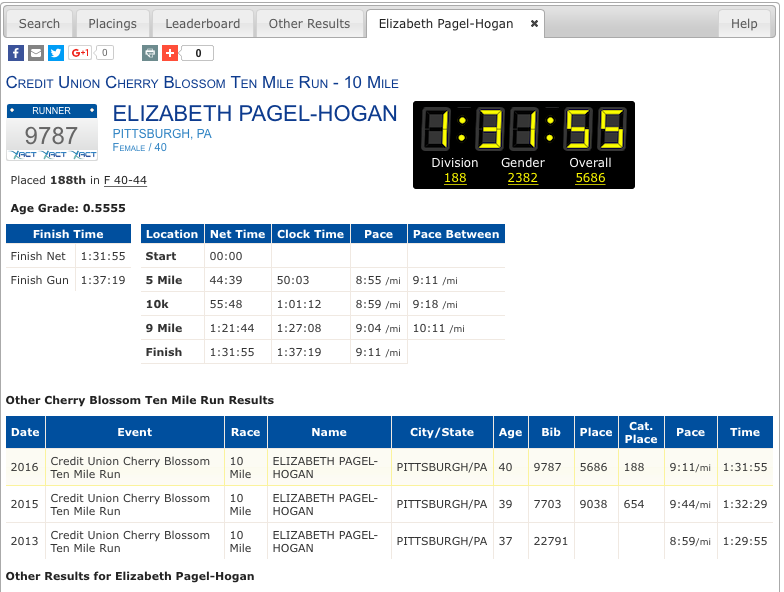 And I ran one pretty fast split in mile 4 when the wind was at my back! So this app claims I ran almost a half-mile over 10 miles. It's not totally accurate since it uses GPS, but I'm also sure I didn't run the shortest, most accurate path over the 10 mile course. 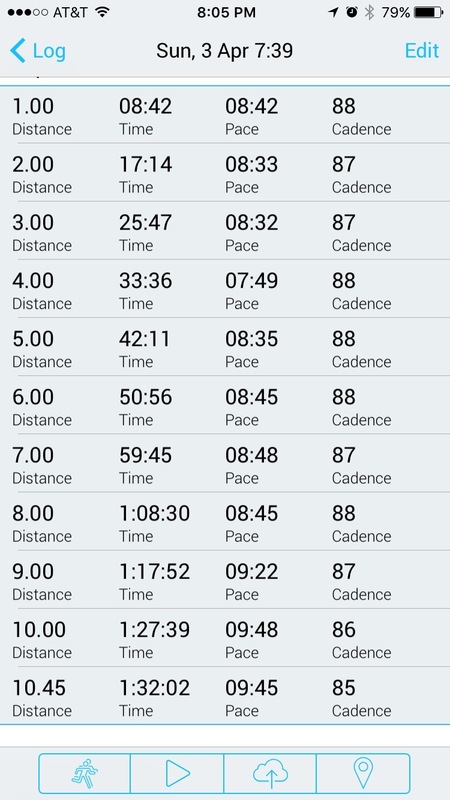 And you can see I was slowing down because my cadence dropped below my normal rate of 88-89. My first five miles were great, but I think I have to admit I didn't have the volume of mileage in February and March to carry me through the last five strong and steady. Something I will try to remember for next year! Many times I forget to be grateful I am able to run. I focus so much on my goals (and falling short of them) I can lose sight of how lucky I am to have the luxury to set goals and work for them. I spend a lot of time worrying about what I should have done during training. The doubts creep on. Did I do the best I could? Was a lazy? Did I slack? But I can't go back and change the past. I can only go forward. I also want to remember to be grateful for people who helped me run. I first ran the CUCB with college friends and for a few years after I had friends with me in the race. Not this year. I had friends in the race, but not with me. I felt a little alone in the crowd of 16,000. But then this lady in the light blue hat appeared in front of me. I stayed with her for 6 miles, until a hamstring cramp slowed me down. I think of her as my secret mystery running partner. Secret because she didn't know I ran with her. Mystery because I only knew her from the back and was surprised to see I had caught her in this photo! I'm grateful to this mystery running partner for being there and pulling me forward. I'm also grateful to my husband who brought the kids out to spectate even in the biting cold wind. I was excited the kids could join us this year. We explored the expo and saw famous runners and I got to see my family four times on the course and each time it was a real boost. I also have say how grateful I am for my sister-in-law who bought hand warmers for my boys!! It took away my worries about them. Last but very far from least, I'm grateful for reaching my fundraising goal. It was not an easy run, and I think that's a good reminder that life isn't easy. Children and families getting treatment at Children's Miracle Network Hospitals probably feel like they are running headfirst, uphill, into a freezing wind, all alone. So I am happy to raise money for them and I grateful to every single person who donated. While I was thrilled to finish as the top fundraiser for the race, I am sad the race didn't reach its runner goal. If each runner had only donated $10, we would have passed the goal. It seems so easy, doesn't it? But we didn't get there. We didn't even get to halfway! 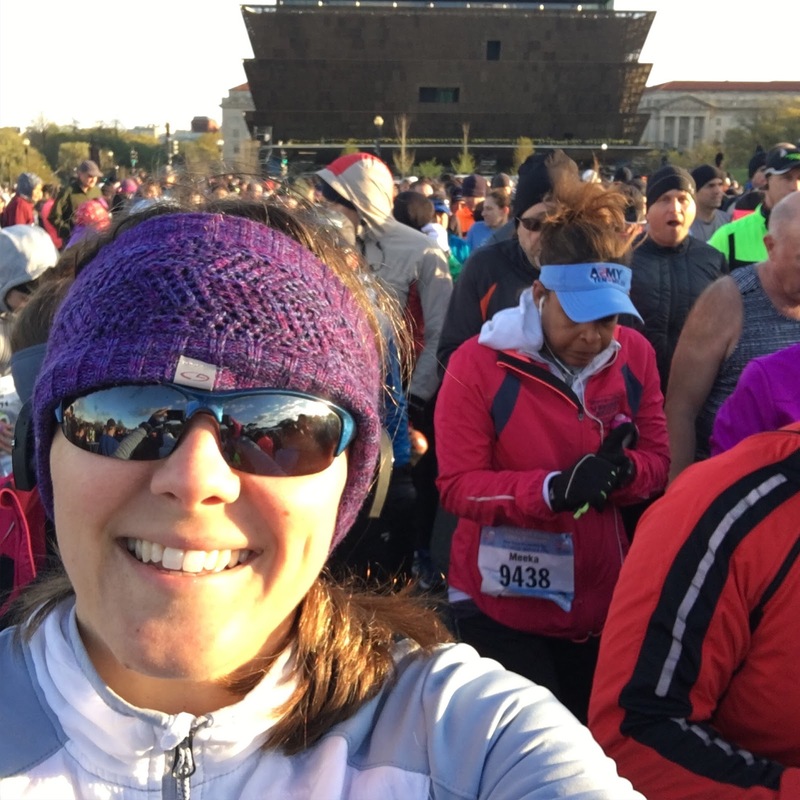 If you didn't get to donate before the race, there is still time. All in all, I'm grateful for the ability to run. (Yes I want to be faster. I'll work on it.) I'm even more grateful for the generosity of my friends and family who helped me reach my fundraising goal. Thank you! !